This New, SPORTS-STYLE dog lifejacket has been designed and extensively tested to give your dog the most ergonomic and comfortable fit possible. 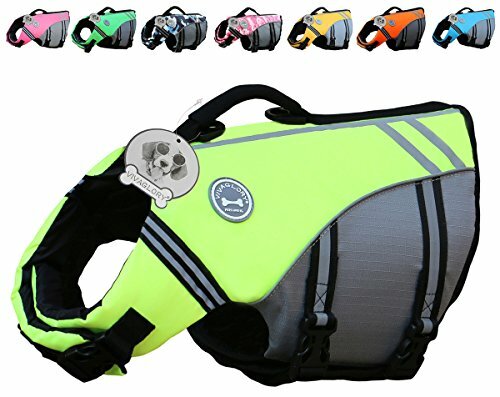 The Neck Part of this lifejacket is strategically positioned on the vest to keep your dog in a natural swimming position at all times. Uses up to 50% more flotation material than many others on the market. This Dog Flotation Device does not hinder your dogs' natural movement. Reflective trim makes your dog visible in all levels of light. A center weighted grab handle makes it easy to carry him/her over any fallen danger or in cases of emergency. High quality Velcro and straps with quick-release buckle create a comfortable and custom fit so that dogs can swim with confidence. VIVAGLORY is a trademark that is registered in the United States. Having been in manufacturing pet products for about 10 years, we have our own professional and experienced Research & Development Department. New products, with diligent design and superior quality, will be released every season, periodically, for our lovely pets. VIVAGLORY loves pets as so much as you. VIVAGLORY also cares for the comfort, durability and facility to clean of pet products. When buying VIVAGLORY products you will get excellent quality and best customer service. We will bring you more enjoyment and satisfaction of owning the pets. Only at VIVAGLORY pet store. If you have any questions about this product by Vivaglory, contact us by completing and submitting the form below. If you are looking for a specif part number, please include it with your message.